The first step towards recovery is admitting you have a problem. I’m a sock snob; I’m addicted to socks. I’m constantly on the look out for that sock that’s comfortable to wear, warm when it’s cold, and cool when it’s hot. In a perfect world a man should be able to wear the same sock, no matter where he’s walking, the weather, or what shoe/boot is on his feet. Of course, the perfect world is somewhere on the other side of a reality that does not exist. That does not mean attempts to find that reality should be considered futile. When I was leaving for basic training my father gave me some of his best advice. He said, “Take care of your feet.” For soldiers – and hunters – you’ll not find better guidance. After all, when done right, hunting is a foot-based endeavor. During the first day of the 2019 SHOT Show I found something I was not expecting. I stumbled on this cute girl sitting behind a small folding table, with a few socks on it. You couldn’t really call it a booth – it looked more like a table you’d run across at a flea market. I asked her about the socks, we talked a bit, and she gave me a pair. I wore them the next day and my feet felt the best they’d ever felt after putting nine miles on them. I was so impressed; I wore those socks for the next two days. Yeah, I know, by the end of the third day, they smelled. A few months later I was in Wyoming hunting coyotes and the thermometer was hovering around zero. But, I had a suitcase full of those new socks; I’d ordered five pair when I returned home from SHOT. My feet stayed warm and comfortable, even in boots you’d not think rated for those temperatures. Sometimes – yes, it’s rare, but sometimes – you find a hidden gem that can change your entire hunting experience. Nothing can ruin a hunt like sore feet, and a good way to keep your feet from getting sore or cold is with good socks. The Farm to Feet Fayetteville Lightweight Technical Crew might be the best socks I’ve ever put on my feet. 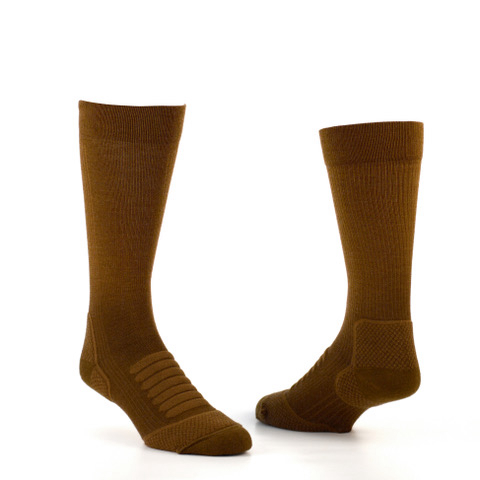 These socks were adapted from a hiking sock made specifically for the armed forces and law enforcement. They’re made with ultra-soft 19.5 micron US merino wool on a 200-needle knitting machine. They have hidden nylon plating, a targeted cushion zone, seamless toe closure, and are made from 51 percent merino wool, 45 percent US nylon, and 4 percent US Lycra spandex. And the best part, they’re guaranteed for life! They’re one of the best pieces of hunting kit I’ve purchased for less than $30.00; at $24.50 I’d call them a steal. Of course, that does not mean my infatuation of finding the perfect sock has ended. Sometimes even after admitting you have a problem and finding a cure, the addiction continues. I’ll keep searching for the perfect sock, but while I’m on that journey, rest assured I’ll be doing it with comfortable feet.